This chickpea curry with tomatoes and onions is a favorite recipe that I got from a friend a number of years ago. I made it the other night for the first time in a while and remembered how much I like it! It is pretty quick to make, so it makes a nice everyday dinner, or could be a good side dish to go with other Indian food and round out a meal. As I usually do for Indian food, I served it over brown rice with homemade naan (flatbread) and raita (yogurt and cucumber sauce). This recipe makes enough to serve 4-6, so if you are having a crowd you may want to double the recipe to make sure there is plenty for everyone! Heat the oil in a large skillet or a saucepan, then add the onions and garlic and cook until the onions are soft (about 5 minutes). Add the spices (except garam masala), and stir for 1 minute. Add the chickpeas and tomatoes and their juice and stir to combine. Simmer, covered, for 20 minutes over low heat, stirring occasionally. Stir in the garam masala and simmer, covered, for another 10 minutes, then serve. I love chickpea curry! I lost the bookmark with my old recipe, so I'll definitely be writing this one down! This is so my kind of food. I love curry. I love chickpeas. 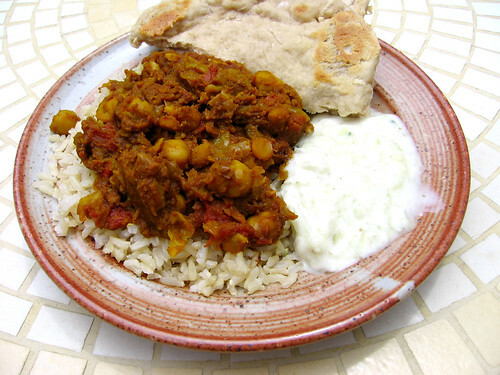 I think I`m going to love your chickpea curry!